Will Inter Still Make The Top Four? When Inter Milan triumphed over Napoli thanks to an injury-time Lautaro Martinez goal on Boxing Day, they looked set to be battling for second place in Serie A, a vast improvement on their fourth place finish from last year. Luciano Spalletti’s side sat just five points behind Napoli following that game, and looked certainties for another season of Champions League football. Yet three league games into 2019, the outlook is very different. Having picked up just one point from these matches, they now sit eleven points behind Napoli and hold just a five-point advantage over fifth-placed Atalanta. Is this merely a blip, or are they in real danger of dropping out of the top four? Last season, Inter started the campaign strongly, keeping pace with Juventus and Napoli until mid-December. However, they then went on a seven-game winless streak to drop down the table, eventually sneaking fourth place on the final day with a dramatic victory against Lazio. Similar issues are arising during this campaign as well. Following Sunday’s disappointing 1-0 loss at home to Bologna, Spalletti assured reporters that “the players are all behind me”, and responded to jeers by saying “it has happened to me before in my career and it won’t be the last time”. Whilst he may argue that his experience of tough situations helps him, Inter fans would have hoped that he would have learnt from the mistakes of his first season and taken the club to a new level in his second year at the helm. Right now, that does not appear to be the case. Spalletti’s Inter are struggling for the second mid-season on the trot. Inter are still waiting for their first league goal of 2019, and it is not hard to see why. In each of their four matches across all competitions since the turn of the year, Inter have dominated possession, enjoying over 60% of the ball in two of those games. Yet their play has been slow and tentative, asking very few questions of the opposition. The pattern of play from the games against Lazio and Bologna last week will have undoubtedly concerned Inter fans. Inter are at their best when they play with speed, utilising the flanks, with their wingers attacking the fullbacks and delivering crosses for Mauro Icardi, a deadly finisher in the penalty box. They have been far from effective with this recently though, and the fact that wide man Antonio Candreva was taken off at half time on the weekend, and replaced by Martinez, a striker, suggests that Spalletti is running out of patience with the formula that has served him best during his time at the club. Things became so desperate later in the game, that Spalletti opted to bring on defender Andrea Ranocchia, and play him up front. When questioned on this tactical decision after the game, Spalletti countered “I don’t have much to say on the matter”. It seems that he had no explanation for the substitution, and was simply desperate to find a goal from somewhere, even the most unlikely of sources. Only AC Milan have scored fewer goals than Inter out of Serie A’s current top nine sides. The attack will need to click into gear soon if the team are to remain inside the top four. Whilst Inter are struggling badly from an attacking sense, there are no such concerns at the back. 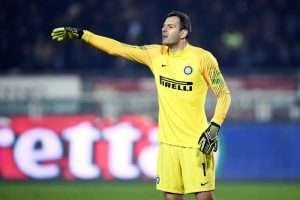 Only Juventus have conceded fewer goals than Inter this season, and despite a wretched run of form since the winter break, Samir Handanovic continues to be a formidable final line of defence. He pulled off some outstanding saves in the Coppa Italia quarter-final last week, with Lazio manager Simone Inzaghi arguing that his side would have won inside 90 minutes “but Samir Handanovic saved everything”. Games are won and lost on such small margins. Inter have only conceded more than once in three of their twenty-two games so far this season. If they can find their scoring touch a little more regularly, alongside maintaining a watertight defensive unit, they should have enough to secure a top-four finish. Spalletti was given the dreaded vote of confidence on Tuesday, with Inter’s CEO Giuseppe Marotta announcing “Spalletti is confirmed to stay”. The pressure is mounting though, and Inter’s next run of games are not the easiest on paper. They travel to Parma on Saturday, who just earned a draw away at Juventus, before taking on Sampdoria and Fiorentina, two clubs battling for European places of their own. In between these matches they face a last 32 Europa League clash with Rapid Vienna. Will Spalletti sacrifice this competition to focus exclusively on turning Inter’s league form around? The next few games make for intriguing viewing, as the battle for the top four heats up. Inter need to get back on track quickly, the chasing pack are closing in.